Duncan Aviation is able to install new RM-855 units without the the use and expense of an OEM Service Bulletin or STC. Since 2006, there has been no production or support for the Honeywell RM-850 RMU and replacement parts are extinct. Honeywell is offering the RM-855 as a form, fit and function replacement unit for the discontinued RM-850 RMU. It has been manufactured for several years, and offers greater reliability and functionality. To upgrade the units, the existing RM-850 connector must be adapted to the new 855. Duncan Aviation is able to install these units without the use and expense of an OEM Service Bulletin or STC. Each unit requires very little labor, and Duncan Aviation's engineering and certification members can approve the modifications through the company's Organization Designation Authorization (ODA). Aircraft downtime is less than a day if parts are ordered in advance. RM-855 upgrades can be performed at any of Duncan Aviation's avionics satellite shops located across the United States. In the case of an RM-850 AOG failure, unit replacement can be performed in the field by an experienced Duncan Aviation avionics technician. 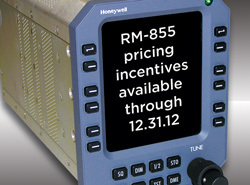 Each installed RM-855 will be covered by a two-year Honeywell warranty, if installed by an Authorized Honeywell dealer.